Today’s an easy one, but it is a question I get asked a lot, so we’re going to go over it. I’m going to show you how to change your Twitter handle. Mine is @karenyankovich, and obviously that’s my name as well, but sometimes people bring on their business and then things change with their business and they’d rather be on their name, or vice versa. It’s really easy to change your Twitter handle. You just go to your profile picture thumbnail on the upper right and go to settings. Then you simply go to the username field and type in a new name. That’s it, you just type in a new name, and go down and click save changes. You do have to find a name that’s available. Then You’ve got to go back and think about where you might have links to the old URL, the URL is twitter.com/karenyankovich, so twitter.com/yourtwitterhandle. 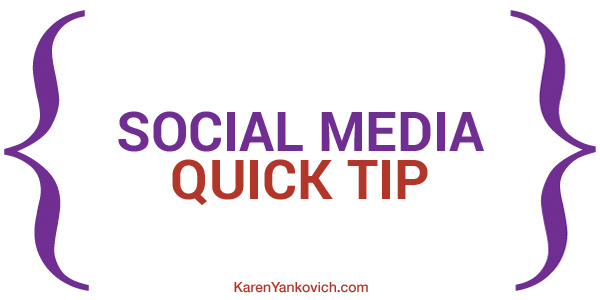 If it’s on your website, if it’s in some blog post, if you guest post for the Huffington Post or other places, you may have given them your old Twitter handle. While it’s easy to change, you’ve just got to be sure you go back in and check all the places that might have the old link, because it will not forward.